SNES Super Mario World 2: Yoshi's Island (USA v1.0) "warp glitch" in 06:14.25 by Deign & laughing_gas. This is a very quick completion of the popular Super Mario World 2: Yoshi's Island. 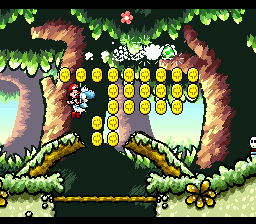 The authors abuse a glitch that lets them warp to any stage up to 6-8 (but requires a certain amount of coins to set up — read the comments for more details), thus making it possible to defeat Bowser in mere six minutes of gameplay.